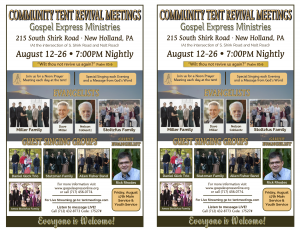 You are invited to attend the 2018 Gospel Revival Meetings. Please come and bring a friend! Everyone is welcome and there is lots of room under the big tent! Dates: August 12th. 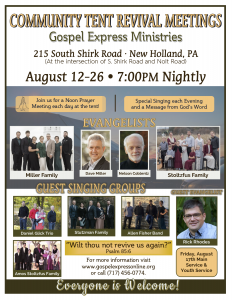 – 26th., 2018 at 7 p.m.
Join us for a 12:00 PM Prayer Meeting each day at the tent. On August 17th., Rick Rhodes will have the main message followed by a message for the youth! Sunday morning service at 9:30 A.M. at the tent on Sunday, Aug. 19th. and 26th. Fellowship Meal – Everyone welcome! UPDATE: Rick Rhodes is planning to share the message on Sunday morning! Location: 215 S. Shirk Rd. New Holland, PA at the intersection of S. Shirk Rd. and Nolt Rd.